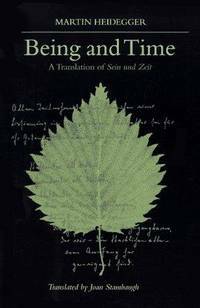 Being and Time is a book by German philosopher Martin Heidegger. Although written quickly, and despite the fact that Heidegger never completed the project outlined in the introduction, it remains his most important work and has profoundly influenced 20th-century philosophy, particularly existentialism, hermeneutics and deconstruction. London: SCM Press, 1962. First Edition. Hardcover. Very Good+/Very Good. First British edition. (Correct first in the English language.) 589 p. Very Good+ in Very Good dust jacket. Faint staining to cloth on front cover. Offsetting to rear endpaper, hinge at rear starting. Name on ffep. Jacket spine panel toned, staining near head, chipped at extremities, small faint dampstain to front panel, price intact. A classic philosophy work. NEW YORK NY: HARPER & ROW, PUBLISHERS. VERY GOOD+ IN A VERY GOOD D.J.. PUB 1962. FIRST EDITION. TRANSLATED FROM 7TH GERMAN EDITION BY J. MACQUARRIE & EDWARD ROBINSON / FIRST PRINTING WITH "COPYRIGHT 1962 BY SCM PRESS LTD" . This is the first American Edition with the 1/4" oversized d.j. that says at the top of the front flap (priced 12.50) "Harper is privileged to present the first publication in English of Martin Heidegger's "Being and Time" and whose back panel is blank and there is 0862 near the bottom of the front flap. Also the copyright information reads "Copyright 1962 by SCM Press Ltd." (SCM Press is the UK publisher of the first edition. All subsequent Harper printings have SCM Press replaced by Harper & Row.) BOOK IS FINE BUT BOTH FREE-ENDPAPERS AND THE HALF-TITLE HAVE THEIR TOP CORNERS CLIPPED. D.J. HAS MODERATE WEAR/RUB WITH SLIGHT LOSS AT THE CORNERS, SHALLOW 1/8" CHIP AT THE TOP OF THE SPINE PANEL, A FEW SHORT EDGE TEARS, AND IS NOT PRICE-CLIPPED. AN EXCELLENT CLEAN, BRIGHT, AND TIGHT COPY. . Condition: VERY GOOD+ IN A VERY GOOD D.J. 2005-09-01. New. Ships with Tracking Number! INTERNATIONAL WORLDWIDE Shipping available. Buy with confidence, excellent customer service! Basil Blackwell, Oxford: 1967. Hardcover with dustjacket. Good condition. Essential for anyone who wishes to understand a great deal of recent continental work in theology as well as philosophy. The significance of this work may be judged by the subtlty with which its author seeks a transformation of traditional ontological conceptions; its wider interest lies in the light it throws on certain features of the human predicament. Includes an Index. 1996-05-07. Good. Ships with Tracking Number! INTERNATIONAL WORLDWIDE Shipping available. May not contain Access Codes or Supplements. May be ex-library. Shipping & Handling by region. Buy with confidence, excellent customer service! SUNY Press. Hardcover. 1438432755 Like New Condition. . Fine. SUNY Press. Hardcover. 1438432755 New Condition. . New. SCM Press, 1962. Hardcover with dust jacket. 1st English edition. Hinge is tender at title page. Dust jacket is edge chipped and scuffed; covered with mylar. Scant penciling. 1978-08-03. New. Ships with Tracking Number! INTERNATIONAL WORLDWIDE Shipping available. Buy with confidence, excellent customer service! 2008-09-08. New. Ships with Tracking Number! INTERNATIONAL WORLDWIDE Shipping available. Buy with confidence, excellent customer service! State University of New York Press. Hardcover. 0791426777 Like New Condition. . Fine. State University of New York Press. Hardcover. 0791426777 New Condition. . New. 1996-08-02. New. Ships with Tracking Number! INTERNATIONAL WORLDWIDE Shipping available. Buy with confidence, excellent customer service! SUNY Press. Hardcover. 1438432755 Special order direct from the distributor . New. SUNY Press. Hardcover. 1438432755 New Condition *** Right Off the Shelf | Ships within 2 Business Days ~~~ Customer Service Is Our Top Priority! - Thank you for LOOKING :-) . New. Harper and Row Publishers. Hardcover. 0060638508 This hardback has a tight spine. Dust jacket in super condition. NO writing. Looks almost new. Very minor signs of wear. Smoke-free storage. . Fine. Harper and Row Publishers. Near Fine in Very Good+ dust jacket. 1962. Hardcover. $12.50 price on jacket flap; owner name on endpaper; some chips on jacket; 1962-08-01; 8.75 X 6 X 1.75 inches; 589 pages . 2005-09-01. Good. Ships with Tracking Number! INTERNATIONAL WORLDWIDE Shipping available. May not contain Access Codes or Supplements. May be ex-library. Shipping & Handling by region. Buy with confidence, excellent customer service! SUNY Press. Hardcover. 1438432755 . New. SUNY Press. Hardcover. 1438432755 Remainder mark . Fine. SUNY Press. Hardcover. 1438432755 Brand New! Not overstocks or remainder copy! . New. Harper Perennial Modern Classics. PAPERBACK. 0061575593 New Condition. . New. Blackwell Publishers. PAPERBACK. 0631197702 New Condition. . New. State University of New York Press. PAPERBACK. 0791426785 New Condition. . New. SUNY Press. PAPERBACK. 1438432763 New Condition. . New. SUNY Press. Hardcover. 1438432755 Item in good condition. Textbooks may not include supplemental items i.e. CDs, access codes etc... . Good. State University of New York Pre, 2010-07. Hardcover. VeryGood. 9.2000 inches 6.3000 inches. SUNY Press. PAPERBACK. 1438432763 Like New Condition. . Fine. 1978-08-03. Good. Ships with Tracking Number! INTERNATIONAL WORLDWIDE Shipping available. May not contain Access Codes or Supplements. May be ex-library. Shipping & Handling by region. Buy with confidence, excellent customer service! Albany: SUNY, 1996. Green and black glossy boards with titles in black and white. This is a translation of Sein und Zeit by Joan Stambaugh. Heidegger's magnum opus. Nice copy. 1st of This Edition. Boards. Near Fine. 8vo. State University of New York Press. Used - Very Good. Former Library book. Great condition for a used book! Minimal wear. 2008-09-08. Good. Ships with Tracking Number! INTERNATIONAL WORLDWIDE Shipping available. May not contain Access Codes or Supplements. May be ex-library. Shipping & Handling by region. Buy with confidence, excellent customer service! Oxford: Basil Blackwell, 1967. 589 pp. Tightly bound. Light bump to lower right front corner. Text is free of markings. Owner's name front end paper and back paste down. . . Cloth. Very Good/Good Dust Jacket. 8vo - over 7¾" - 9¾" tall. New York: Harper and Row, 1962. Full black cloth with gilt lettering on the spine, Previous owner's name "Michael J. Hirschfeld" on front free endpaper, much underlining in ink with much marginalia in the first 3rd of the book. The later 2/3rds unmarked. Minor spot to cover, overall in FAIR condition only.. Full Cloth. Fair/No Jacket. 8vo - over 7¾" - 9¾" tall. Hardcover. State University of New York Press, 1996. Hardcover. Good. Disclaimer:A copy that has been read, but remains in clean condition. All pages are intact, and the cover is intact. The spine may show signs of wear. Pages can include limited notes and highlighting, and the copy can include previous owner inscriptions. At ThriftBooks, our motto is: Read More, Spend Less.Dust jacket quality is not guaranteed. London: John Calder, 1987. 589pp. Black cloth hardcover with gilt spine titles, minor wera to the dustjacket with a 1/4 inch tear at the foot of the spine panel. Previous owner's book plate on the front endpaper. A translation of Sein Und Zeit, by John Macquarrie and Edward Robinson.. Reprint. Paperback. Near Fine. 8vo - over 7¾" - 9¾" tall. 1996-08-02. Good. Ships with Tracking Number! INTERNATIONAL WORLDWIDE Shipping available. May not contain Access Codes or Supplements. May be ex-library. Shipping & Handling by region. Buy with confidence, excellent customer service! Blackwell Publishers, 1978-01-01. New Ed. Paperback. Used:Good. New York: Harper Collins, 1962. Translation of Sein Und Zeit by John Macquarrie and Edward Robinson. A cleaan, tight, unmarked copy.. First American Edition - Latter Printing. Cloth. Fine/Near Fine. Octavo. Harper & Row, 1962. Hardcover. NF. Light shelfwear./VG. Tears, creases.. Translation of Sein und Zeit by John Macquarrie and Edward Robinson. Harper Perennial Modern Classics. PAPERBACK. 0061575593 Like New Condition. . Fine. Blackwell Publishers. PAPERBACK. 0631197702 Like New Condition. . Fine. State University of New York Press. PAPERBACK. 0791426785 Like New Condition. . Fine.